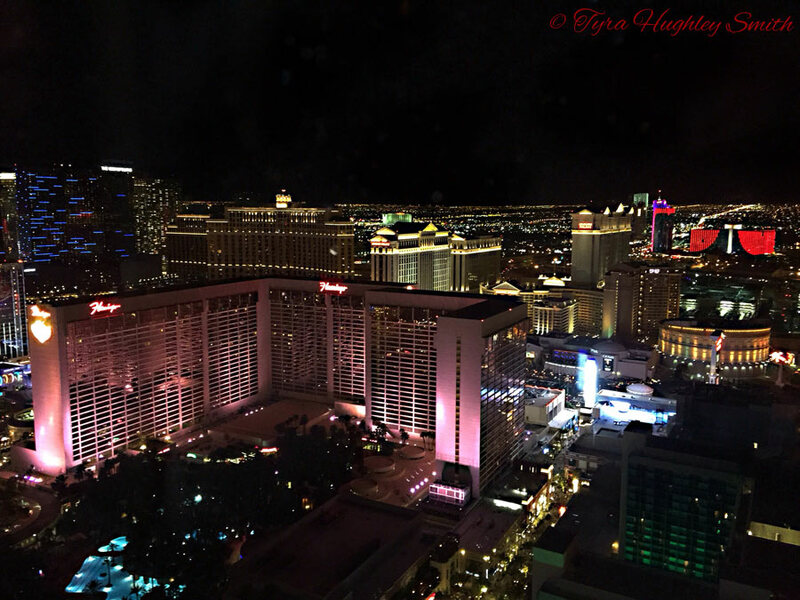 I frequent Vegas pretty regularly, usually a couple of times a year. 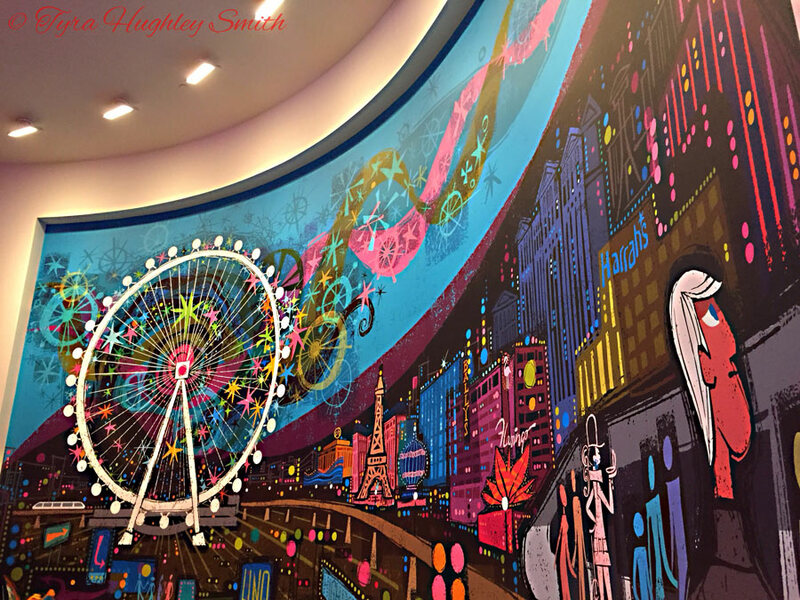 On this last trip, I took some time to explore the new LINQ complex. It is an area filled with restaurants and shops connected to The LINQ Hotel & Casino. 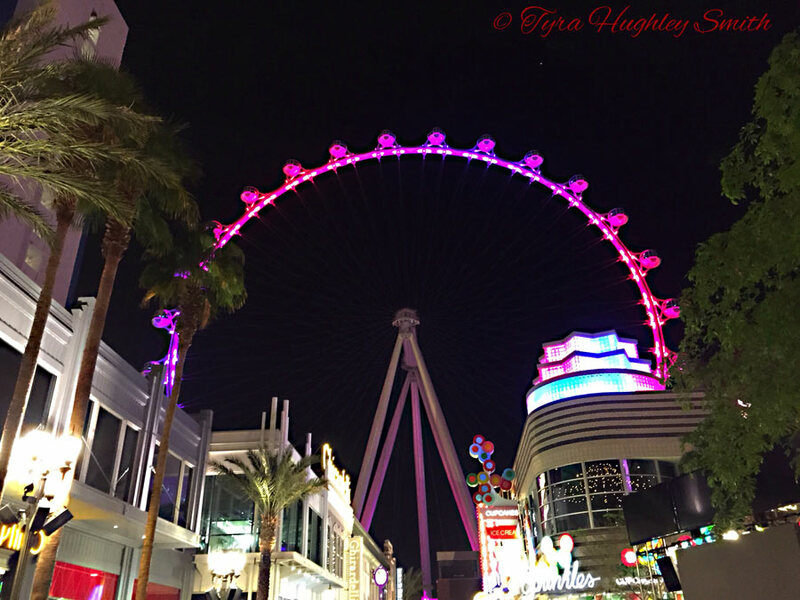 The main attraction at The LINQ is The High Roller, the world’s largest observation wheel. 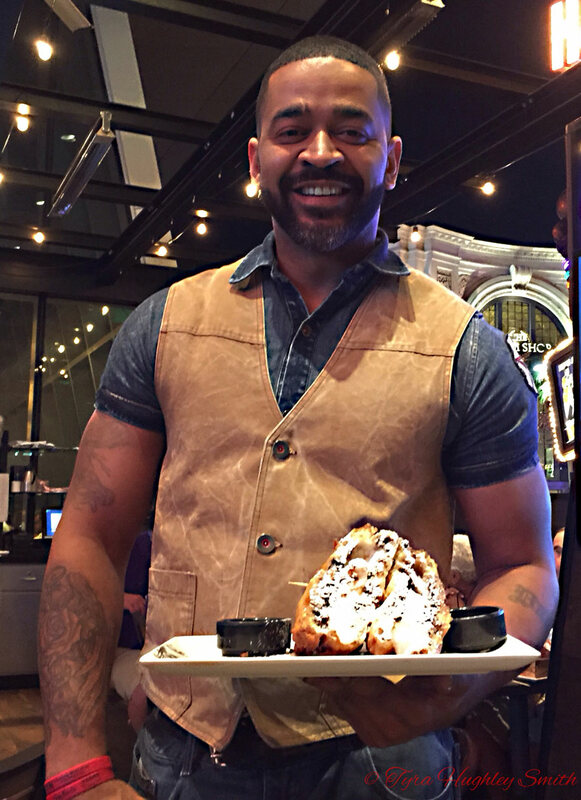 So below is a photo essay of the sights and tastes of The LINQ. I will start with the tastes since it is much shorter than the sights, but be sure to scroll through for some of my favorite pics from the evening. Since I have already done a post on Brooklyn Bowl, and touted the wonders of the red velvet cupcake from Sprinkles, I will only focus on one eatery in the LINQ of Triple-D fame. 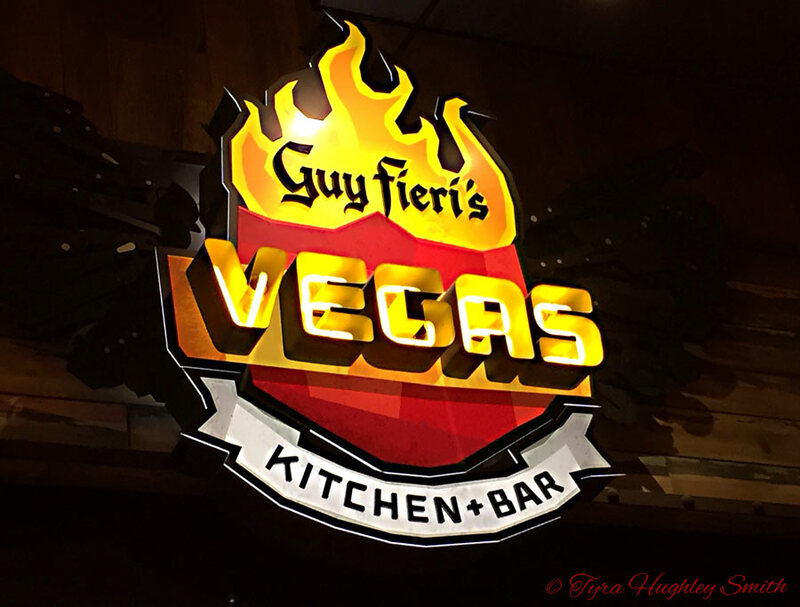 Guy Fieri, host of ‘Diners, Drive-Ins and Dives’ on Food Network, opened his first Las Vegas restaurant, Guy Fieri’s Las Vegas Kitchen and Bar. So having watched his nationwide eatery journey, I wanted to stop by his restaurant to give it a whirl. The food was great and we were seated much quicker than we expected (only 20 minute wait…on a Friday night…during spring break… and March Madness). To accompany our main course, we had the Dragon’s Breath Chili Cheese Fries. 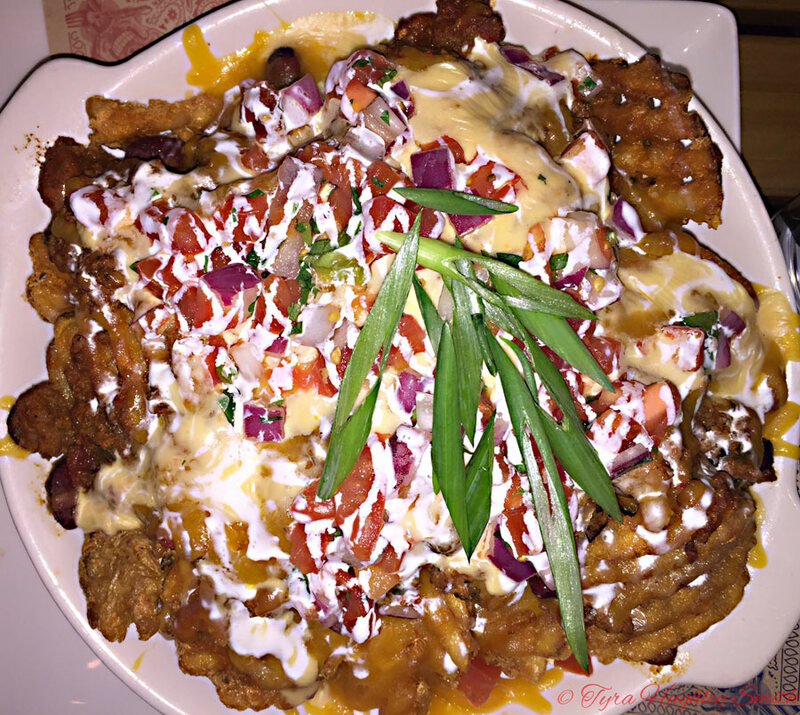 A literal mountain of waffle fries covered in savory chili and topped with cheese, pico de gallo and sour cream. It was ridiculously huge and we ate 1/3 of it, total. The main course was the reason we decided to try the restaurant and is the house specialty. A Bacon Mac-N-Cheese Burger. Yes, bacon and mac and cheese, on a burger, on a brioche bun. The burger wasn’t massive, but we split it. It was amazing. The fusion of flavors was top notch. Epic it was indeed! It was legendary! 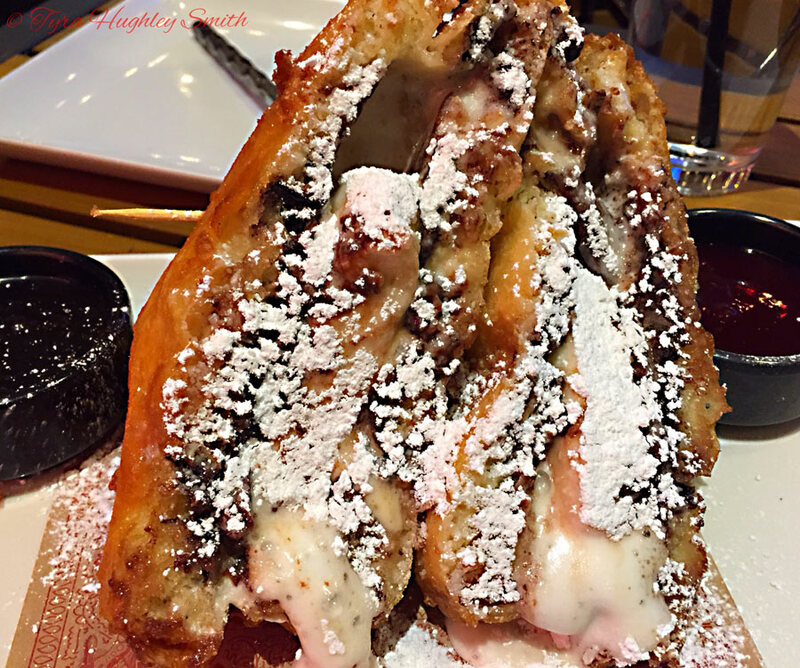 Fried brioche with chocolate and marshmallow with dipping sauces. Look at it; it was mountainous. We only ate 4 bites. And lastly, this was the view with dinner. Yum. 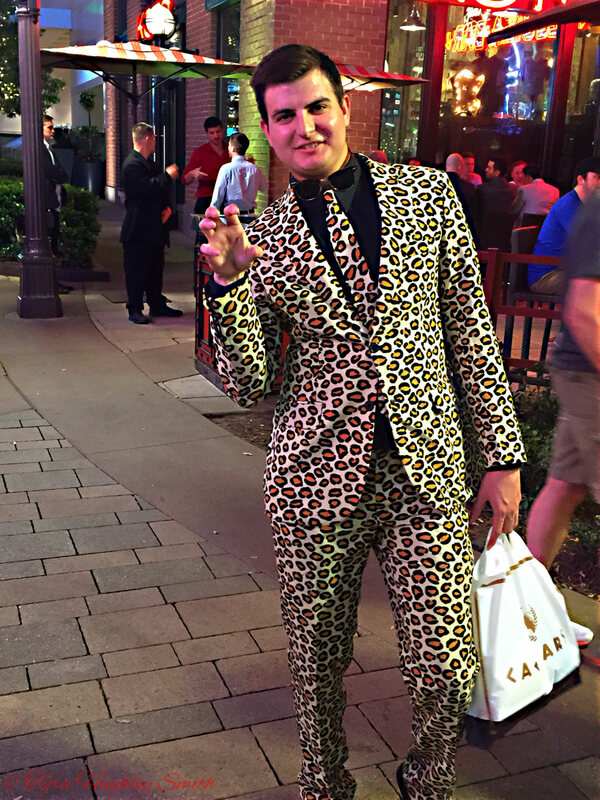 Now, on to the Sights of The LINQ. The LINQ is comprised of a casino/hotel, along with numerous restaurants and shops along the pathway. 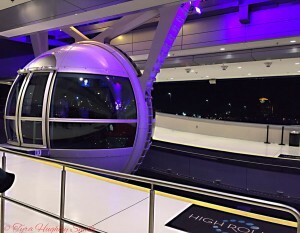 But the main attraction is the High Roller, the world’s largest observation wheel. 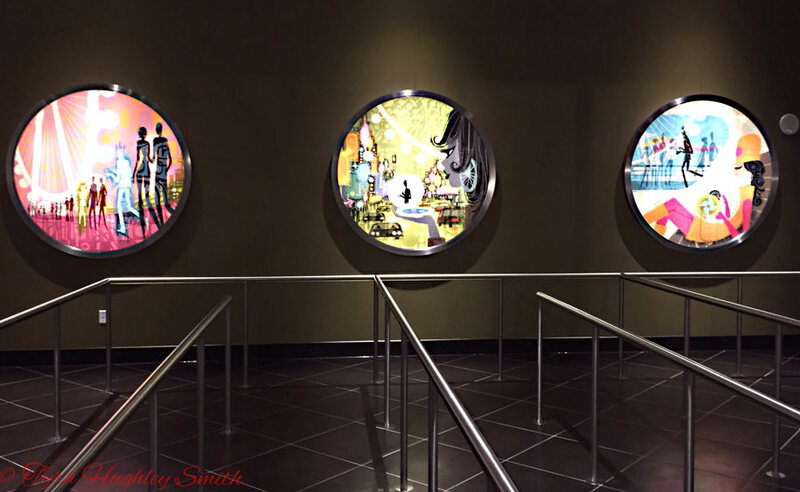 The lobby of the High Roller was where we first noticed the awesome murals. 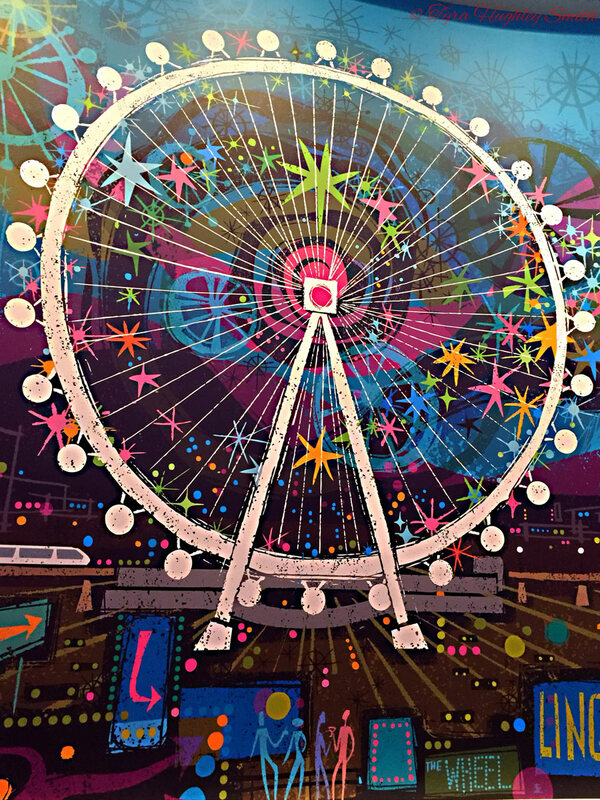 The main one is huge and is a colorful depiction of the Vegas strip and the High Roller is the centerpiece. 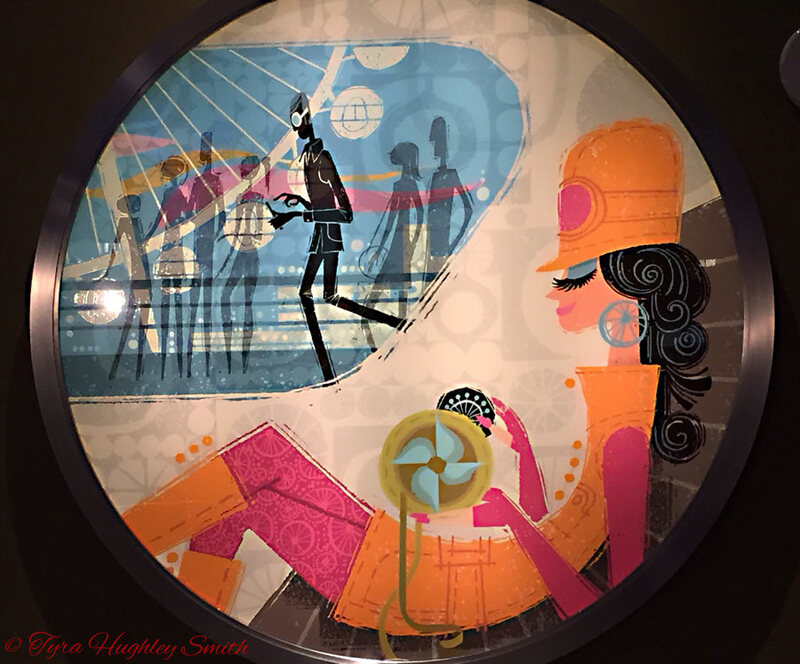 A zoom in of the High Roller portion of the mural. 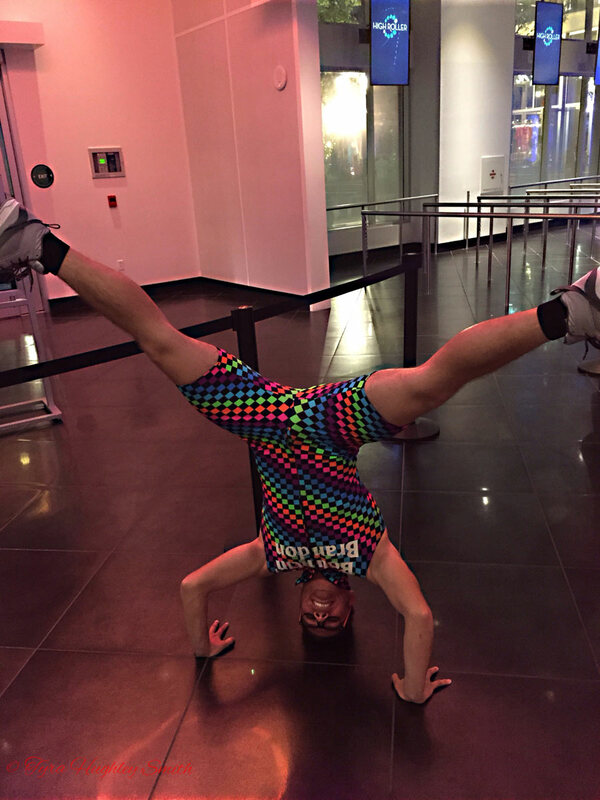 We even had our very own Vegas performer with us to entertain us for the ride. Bouncin’ Brandon. It is Vegas, after all. 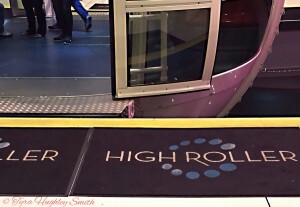 Then, it came time for the High Roller itself. When we made it to the loading area, I learned that the wheel never stops. You have to step on as it is moving. This didn’t thrill me, quite honestly. It was even more nerve-racking when you look below and see there is a net across the whole bottom area. They explained that this is for people who miss it and fall. So people actually fall and land in the net. Oh, okay. Not okay. But then, when we made it to the top. That view… wow. This is a show-don’t-tell moment. The colors and lights were great against the night sky. 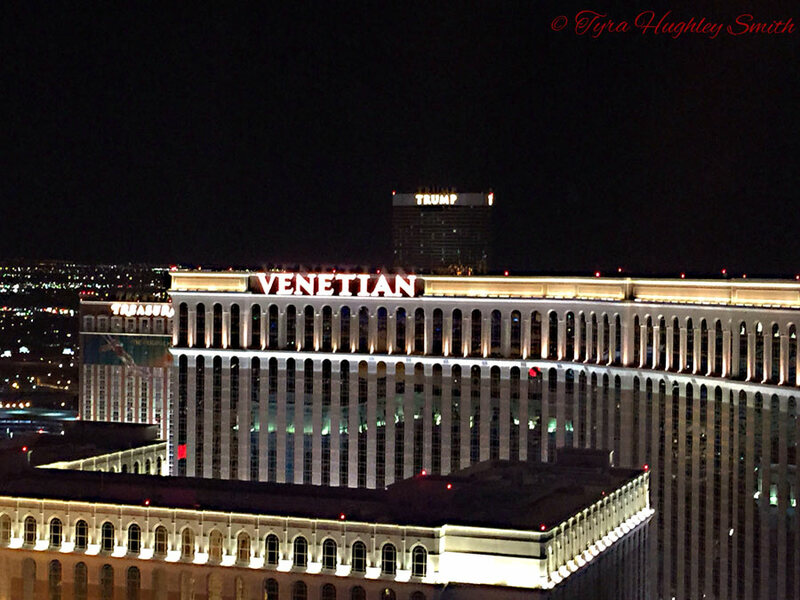 There were panoramic views of the Strip. The other cars in front and back with the technocolor, changing lights were pretty cool as well. The whole ride is about 30 minutes. Fun fact: It is damn-near impossible to take pictures in this thing, especially at night, because of the thickness of the glass. Flash is a huge no-no (and they tell you so in the video that’s playing), but even without flash the glare was remarkable. I was getting so frustrated trying not to capture myself in the shots and minimize glare. I got a few good photos with my pro camera, but some of the best ones were courtesy of the iPhone 6 camera. All in all, I enjoyed the ride. 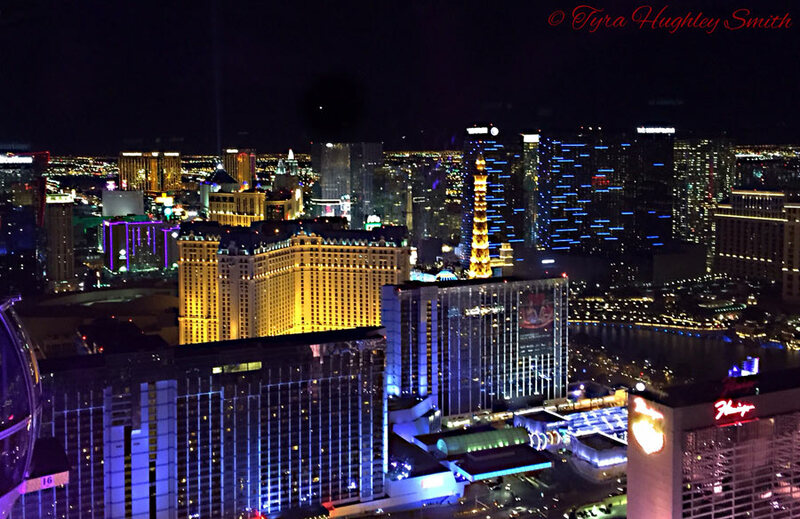 The view was great and seeing the Strip all lit up at night was pretty awesome. 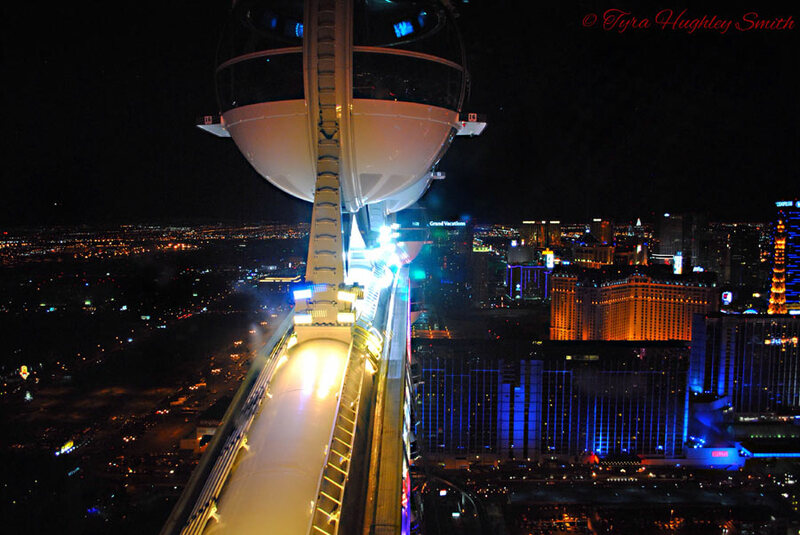 But those aren’t the only views the LINQ has to offer. 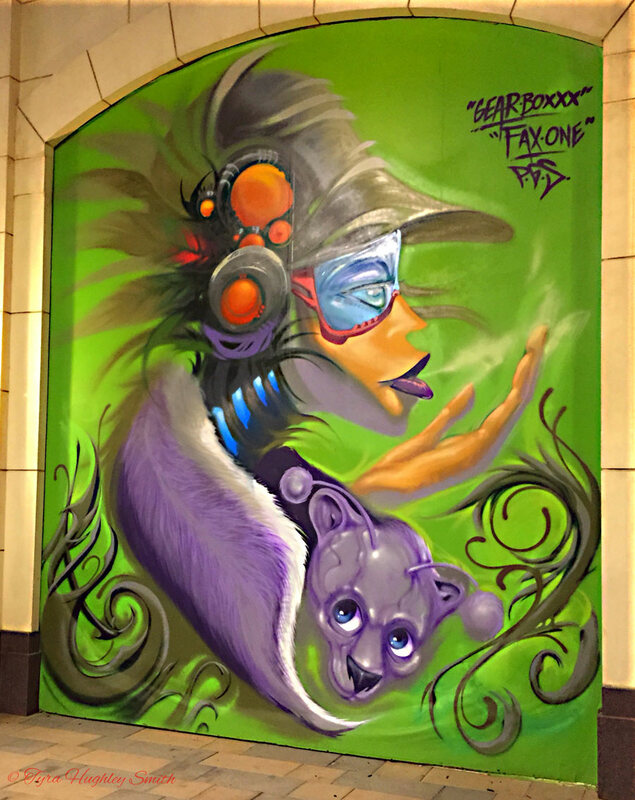 In addition to the High Roller, there were some fantastic people (Street Style, Vegas edition), and one of the highlights was the murals painted along the walkway. The colors were so vibrant, they drew you in. 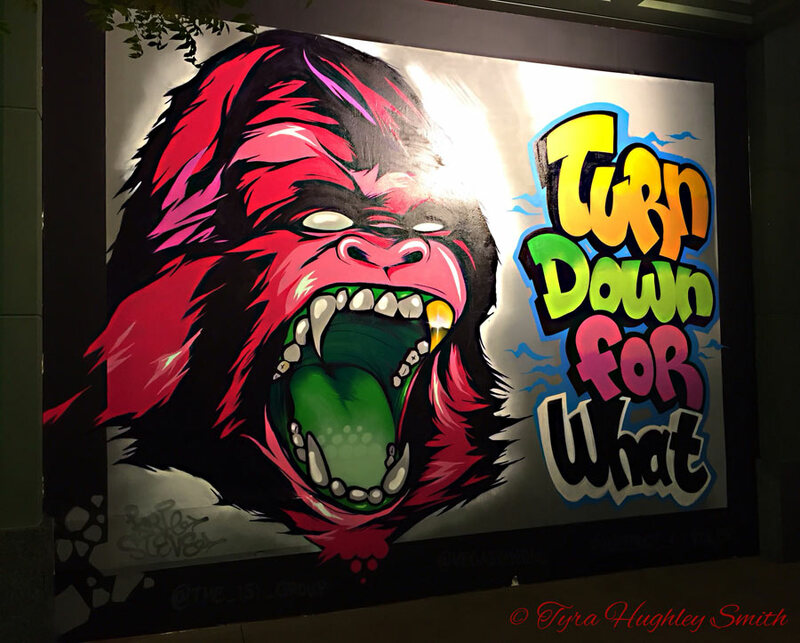 And, of course, the Vegas unofficial anthem… Turn down for what? 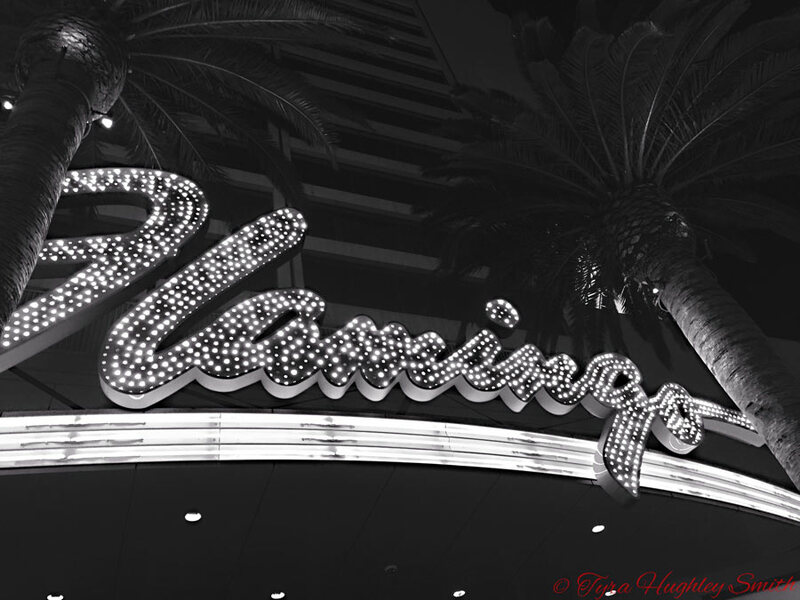 On the way back, we went through the old Flamingo hotel. I hadn’t been in this hotel for years. It’s vintage feel and history inspired me to switch it up a bit. And there you have it. 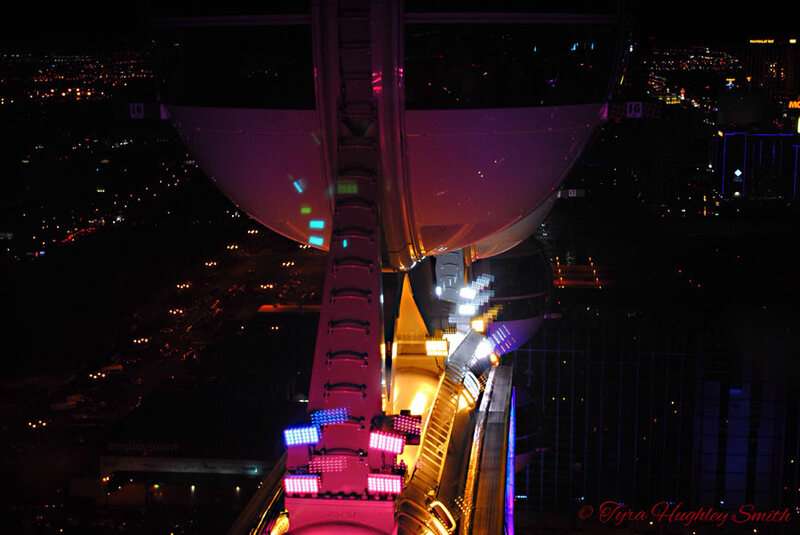 The LINQ, in photos. 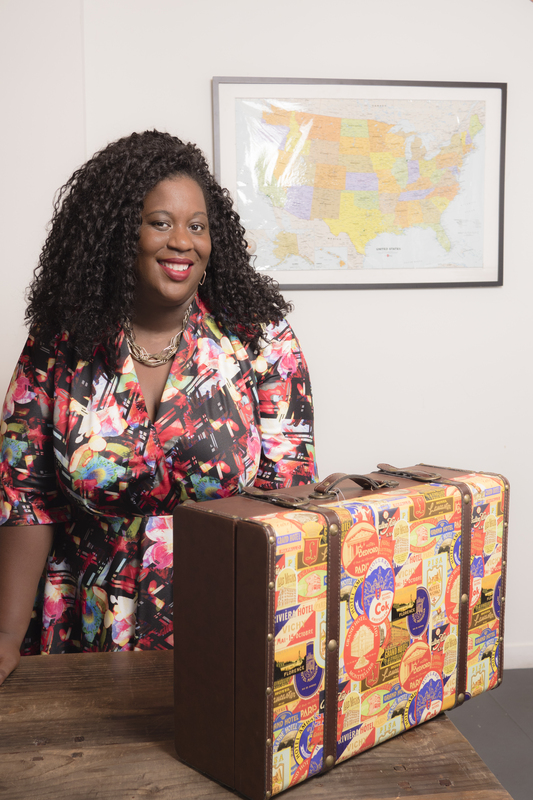 All photographs are copyright of Tyra Hughley Smith. 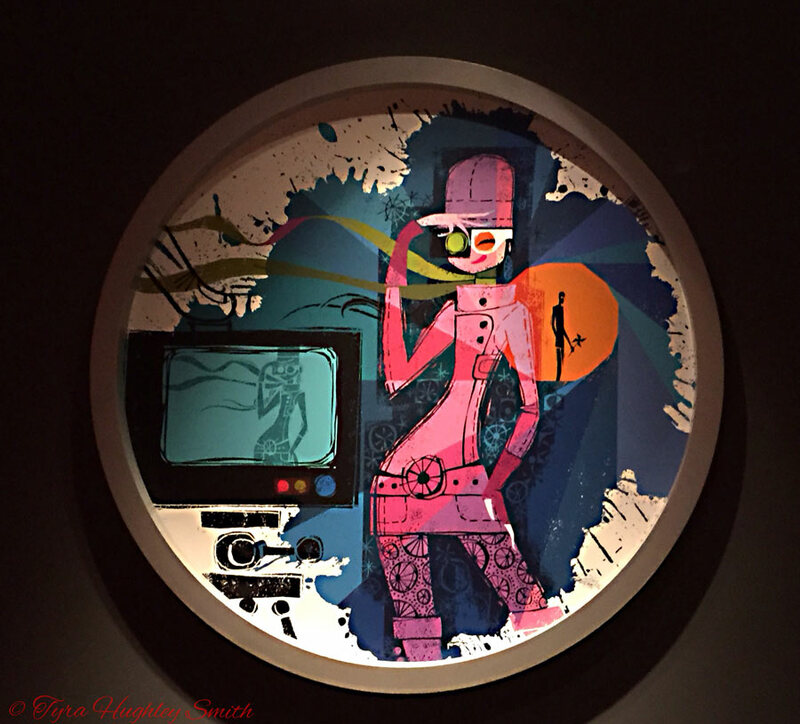 However, the murals and underlying works belong to their respective copyright owners and Tyra Hughley Smith makes no assertion as to their ownership. 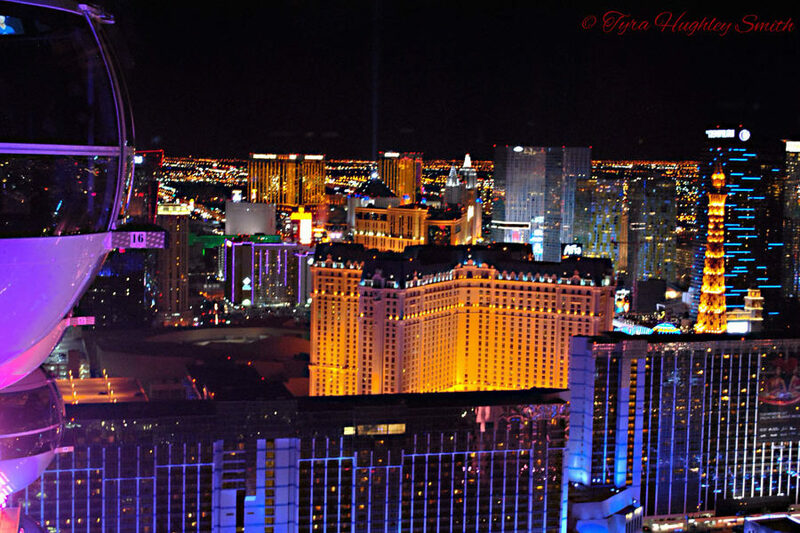 I definitely need to make it back to Vegas sooner rather than later! Thanks for sharing your experience with us. I should have taken notes so I don’t forget anything. 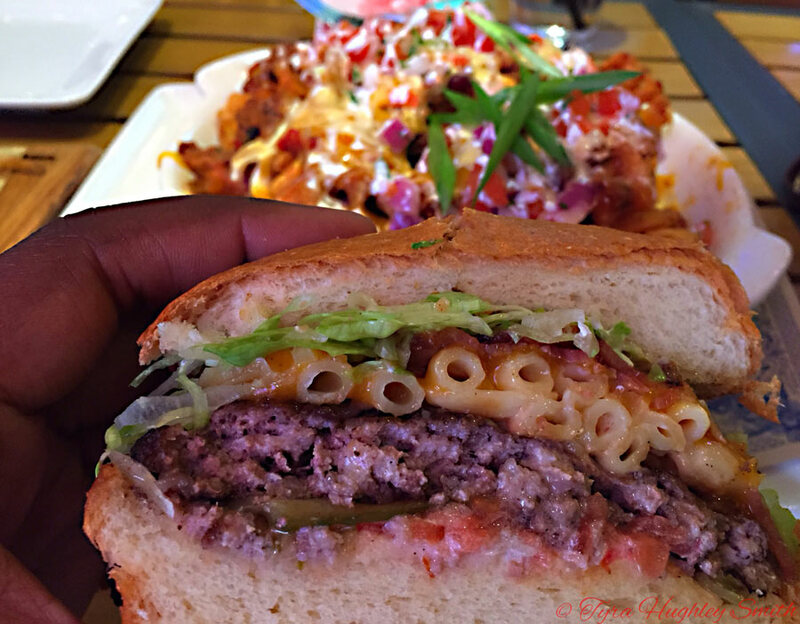 That burger deliciousness with the mac and cheese looked like everything dreams were made of and more. You had me at the waiter, LOL. 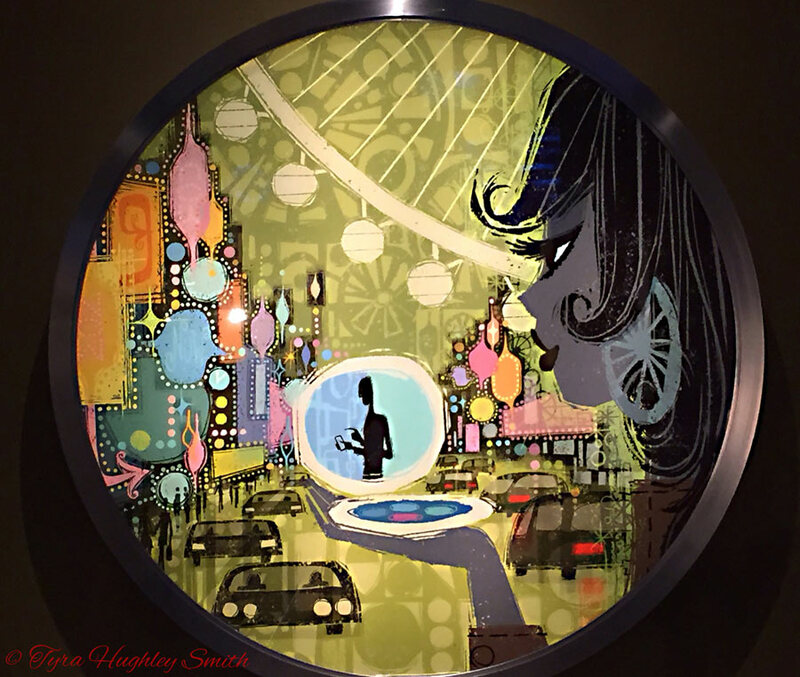 I love Guy’s show and the restaurant looks like it is his take on what he highlights in the show. I’ve never been to Vegas, but am dying to visit. Thank you for the beautiful pictures. This looked Amazing. 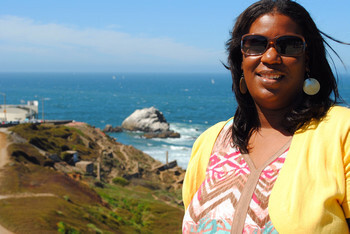 Looking at that food and the views, I need to make this happen to. 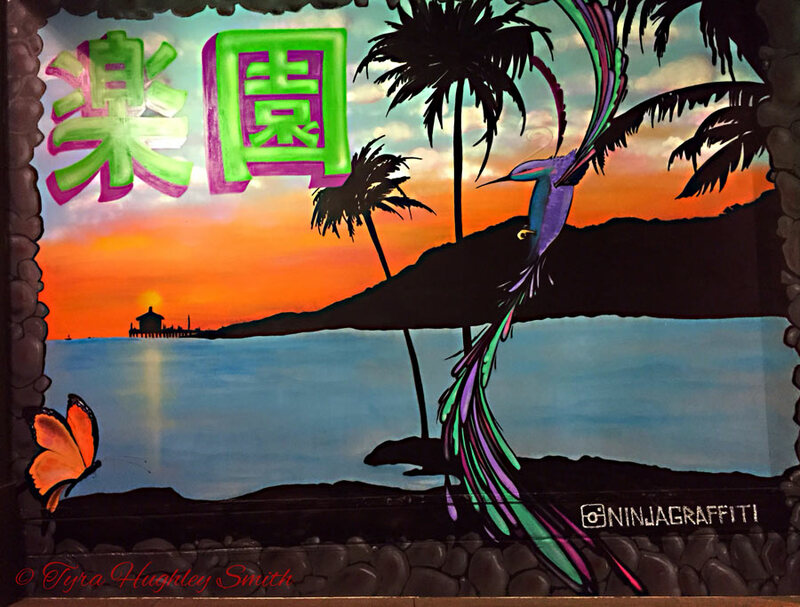 Your pics are Fantastic! This looks like an awesome place to visit. Would you believe I’ve never been to vegas before? Looks amazing! How fun! It’s high on my bucket list. How fun! I would love to visit Las Vegas sometime. I have heard that it is a beautiful place to visit with so many things to do! Truly there’s no place like Las Vegas! 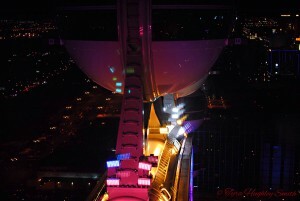 I love the nightime scenery that you captured. Now I want to go back and have fun there too! I’m from Las Vegas, so this post makes me so happy! 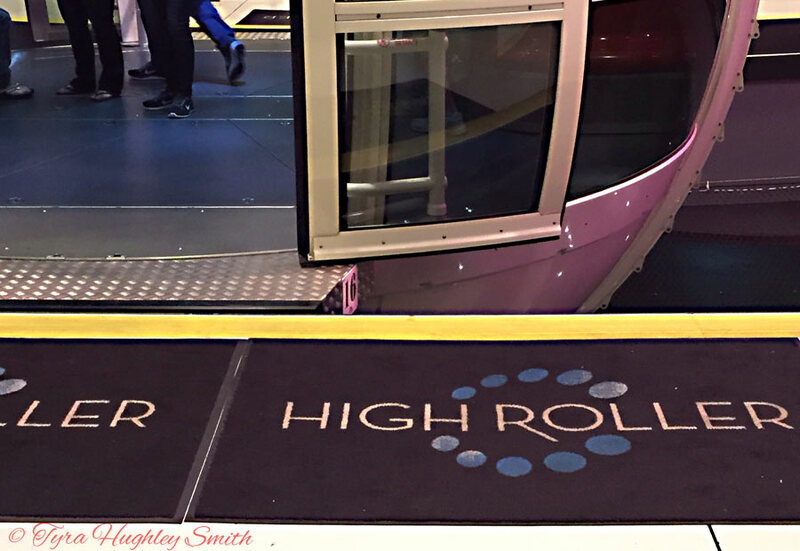 I haven’t been back to visit for a couple of years, so I haven’t been on the new high roller!! That dessert is now on my list of must-do’s in Vegas. YUM! And the ride looks incredible, too. I’m glad you found a few photos that were okay to use. There’s nothing better than good scenery and comfort food. The server looked as delicious as the burger with the noodles on it. Looks like fun! I’ll be sure to try out the LINQ next time I’m in Vegas. I love Vegas. I haven’t been in years, but it’s one of my favorite places. Your photos are great! The high roller observation wheel looks awesome. Man 20 minutes is a long time lol. They must have tons of customers everyday. We’re a fan of him on the show as well. This restaurant sounds incredible. The bacon mac-n-cheeseburger and a plate of waffle fries would be so delicious. Oh my gosh the food looks amazing!! I have not been on this ride in Vegas looks amazing! 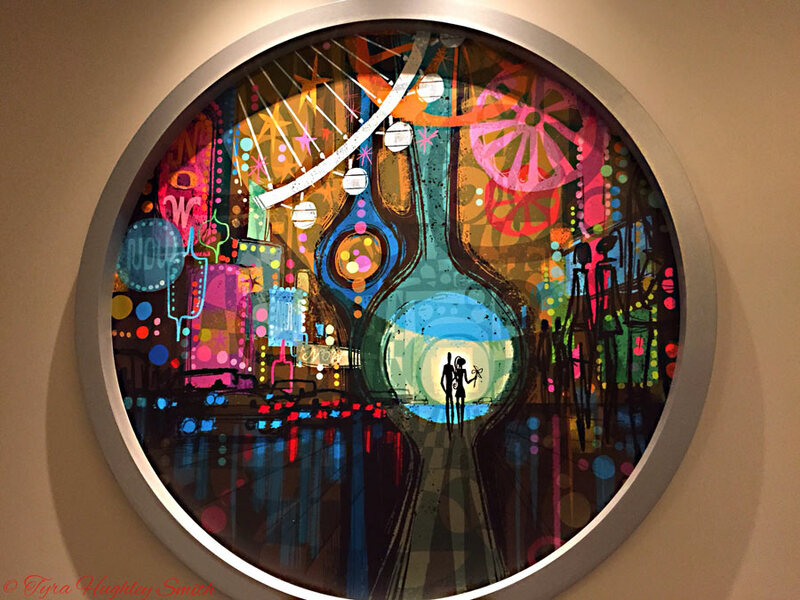 I just stayed at the Venitian about a month ago. It was really nice. I don’t remember seeing this hotel, it must not have been in view from our 20th floor. We had a view of the Mirage instead. Looks like you had some fun and had some fun thugs to eat. What a lively post today! The food looks amazing and looks to be the type of place I would love to experience! What a beautiful town with so many colored lights. We don’t have views like that around here. The food all looks incredible and there sure are some colorful characters (street style) pictured too :). Much different than the cowboys around here, I have to say. lol I mentioned it doesn’t stop as well, but people actually falling on to the net is new to me. Not surprised though. Many people get drunk before, during, and after they get on. I watched 2 drunk wen get escorted down the ramp by security. Great experience. I like the new area, gives in a new dynamic. Especially for someone like me who frequents Vegas. 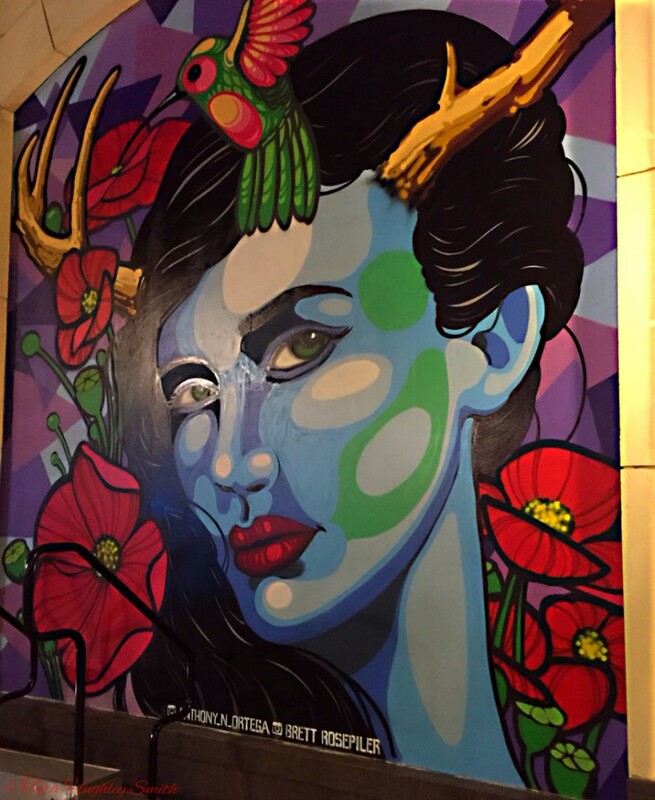 Love your pics of the mural.